Author Caroline Woodward returns to West Kootenay this month and reads at the Nelson library on Sept. 24 from her book Light Years. There are days when any of us would like to relocate to a remote island. Author Caroline Woodward did it. There are days when any of us would like to relocate to a remote island. 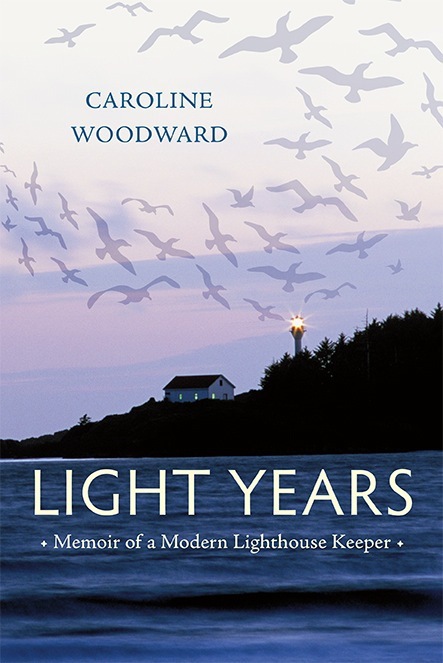 Author Caroline Woodward did it, and eloquently describes the experience in her new book Light Years: Memoir of a Modern Lighthouse Keeper, published this fall by Harbour Publishing. Woodward launches Light Years at the Nelson Public Library on Thursday, Sept. 24, as well as at the Nakusp Public Library on Sept. 23 and the Bosun Hall in New Denver on Sept. 25. All events start at 7 p.m.
Woodward’s early resume includes traveler, teacher, social worker, writer, board chair, choir member, bookstore owner, and publisher’s sales rep. She left a chock-full life when she joined husband Jeff George as assistant lightkeeper on Lennard Island Lightstation in 2008, trading freeways for freewheeling seagulls. Kootenay folks may remember Woodward from her student days at David Thompson University Centre, her years raising a family in Nelson, and her stint as owner of the Motherlode Bookstore in New Denver. Her early books include Disturbing the Peace (Polestar, 1990), nominated for the Ethel Wilson Fiction Prize, and Alaska Highway Two-Step (Polestar, 1993), nominated for an Arthur Ellis award. And then Woodward got busy, and nearly two decades flashed by. When Woodward made the move to Lennard Island, the writing began again. First came her novel Penny Loves Wade, Wade Love Penny, (Oolichan, 2010), followed by two books for children: Singing Away the Dark (Simply Read, 2010), based on her own Peace River childhood, and The Village of Many Hats (Oolichan, 2012), inspired by the village of New Denver. Light Years describes the creative and personal rejuvenation she found in the lighthouse life. Because yes, it is possible to live in isolation, with the sea at your door and the wind howling around you and just one human being for company, and thrive. The event includes a 30-minute slide show of Jeff George’s photographs as a backdrop to Woodward’s reading, plus time for questions. Otter Books will be on hand with copies of her books. Woodward’s launch is made possible with financial assistance from the Canada Council for the Arts through the Writers’ Union of Canada.